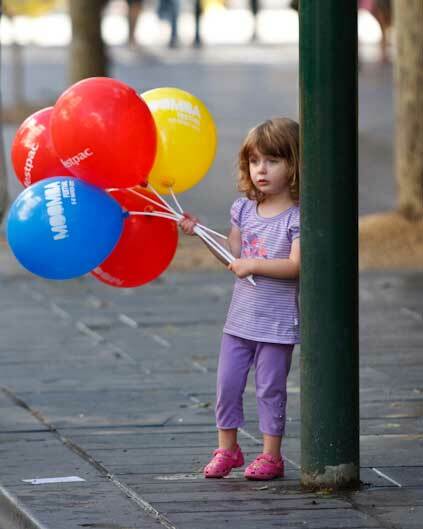 Bring impact to your Street Parade with Balloon Handouts! Want to make your street parade explode with colour and excitement? Need your street march to have impact? Bright, colourful balloon handouts make a street party! Nothing comes close for cost effectiveness, fun, and movement. At Magic in the Middle we have the benefit of working with thousands of clients. We have inflated millions of balloons - literally! We take the time to ask the right questions so your promotion or event will be as memorable and cost effective as possible. Balloon handouts will enhance and build a positive image for your brand. Balloon handouts do more than just advertise a company. They allow the company to engage with customers. Other companies might sell you their printed balloons, but are they inflated? Will they provide 5000 inflated balloons ready to handout at 9am? Will they do this in other states? We have and we can! What sets Magic in the Middle apart from the others? Children will demand your advertising message. Complete strangers will become walking billboards spreading your message. Easily colour matched to your company logo / company theme.